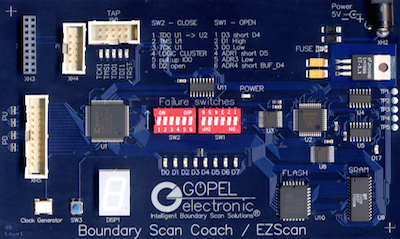 EZScan Coach is a demo / training board that can be utilized to illustrate and learn the development, debugging, and execution of basic boundary-scan test and in-system programming applications. Often we utilize the EZScan Coach board as part of entry level training classes as well as for demonstration purposes. The board can also be purchased for your own in-house training purposes or as a reference board that could be used for system troubleshooting. Please note that we also offer a Tutorial that shows how tests and ISP applications for the EZScan Coach are developed in SYSTEM CASCON. This tutorial can be accessed from within the CASCON software and can be downloaded from our GENESIS customer support website. If you cannot locate the tutorial or need to get access to GENESIS, please contact the GOEPEL support team using the "contact us" link just below this article.